1) Buoyancy: Children that are not able to walk on land are often able to walk with the buoyancy assist of water. Therapists assist this process with guiding movements at their trunk and legs in order to gain a forward momentum for walking. The principle of buoyancy can also help kids complete milestones such as rolling, crawling or standing in the water that will translate to more milestones on land. The principle of buoyancy makes walking in deeper water (at upper ribcage) easier then walking at waist level. So, when a child has mastered walking at deeper water, we will transfer the task to shallower water to more simulate walking on land. 2) Resistance: Water has a natural resistance property that helps to strengthen muscles. Even just walking forward, backward and sideways in the water can have a positive effect on building muscle in the legs and trunk. 3) Gains in range of motion: Therapy pools are generally set between a comfortable 80 and 90 degrees, which is a perfect temperature to help muscles relax. This temperature can allow the therapist to improve the flexibility of specific muscles that may be hard to relax and stretch otherwise. By completing passive and active strengthening exercises in the water, gains are often seen in the flexibility of joints that correlates to bigger step length, less risk for contractures and more relaxed kids! 4) Sensory: Kids with autism or other sensory processing disorders generally feel more at ease in the water, due to the large amount of proprioceptive input that they receive in the water-up to 14 times the normal amount! The deep pressure and tactile input that the water provides increases awareness of where their arms and legs are and what it feels like to move them, often leading to a more organized, relaxed child. 5) It’s fun! Often if kids plateau or are burned out of therapy in the clinic, switching to aquatic therapy can really give their attitude a boost. A change of environment, new activities and different ways to work their muscles can really have a positive effect on their motivation to do therapy. Get your video cameras ready if you and your child are interested in pursuing aquatic therapy. They will likely meet milestones that they haven’t been able to meet on land, such as standing, walking, stair-climbing or jumping. Aquatic therapy can also provide confidence for improved independence in the water by learning important life-skills, such as floating, treading water and increasing comfort level in the water. 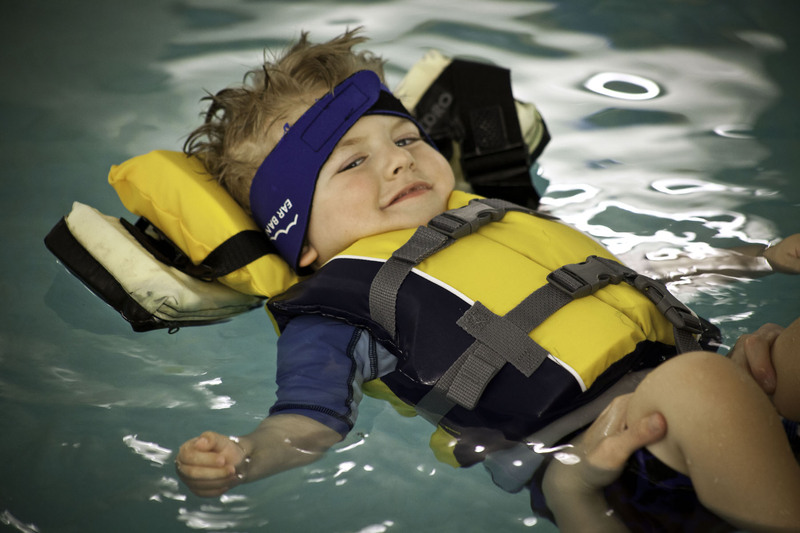 Easter Seals DuPage & Fox Valley has a fantastic aquatic therapy program and getting started is easy! Contact our intake coordinator at 630.282.2022 to ask questions or schedule an appointment. Or, visit us online at EasterSealsDFVR.org for program details. 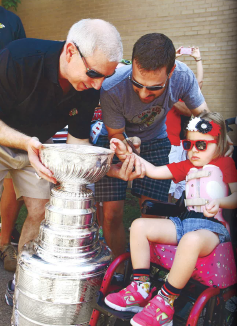 The story of how four-year-old Cameron “Cammy” Babiarz, a client of Easter Seals DuPage & Fox Valley, uses “goal setting” as a motivational strategy was recently featured in the Blackhawk’s new book One Goal II: The Inside Story of the 2013 Stanley Cup Campion Chicago Blackhawks. Cammy was born with Rett syndrome, a rare neurological disorder that affects 1 in 10,000 children, and almost exclusively girls. The Babiarz family created a summer 2013 bucket list of things to do including going to the beach, holding a sparkler on the Fourth of July and touching the Stanley Cup. Bill said that by far, having Cammy touch the Stanley Cup was the longest shot of all, but it was the most important because even though Cammy cannot speak, walk or crawl, she is happy, social and likes to watch hockey on television. On short notice, Blackhawk President and CEO John McDonough, helped Cammy achieve her goal. The Blackhawks asked the family to join Mr. McDonough at one of his appearances with the Stanley Cup, and Bill said they were treated like royalty. “Jackie and I had no expectations beyond just being there,” Bill said. “But then we pulled the car up. Security knew who we were. We had our own parking place and Brandon Faber came right over to us . . . I was shocked!” Before his appearance, Mr. McDonough had a private greeting with Cammy and her family. Cammy has received services at Easter Seals DuPage & Fox Valley for two years. Everyone in her family is involved, including her grandfather Bill who takes her to therapy sessions and attends the Grandparents Corner social group once per month. “Setting goals helps children achieve foundational skills, so that they can be more involved in their family and their community,” Laura Harmasch, Easter Seals DuPage & Fox Valley Occupational Therapist said.